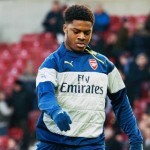 The England U20 international is convinced staying with the Gunners is the best decision for his career. “It’s amazing,” he told Arsenal Player. “It’s a striker’s dream to play with Santi Cazorla, Tomas Rosicky and those world-class players in the squad. They care about you on the pitch – they want you to get goals, they’re looking for you. “They’re not selfish players. They’re good lads as well, genuinely nice people and you can only improve training and playing with those types of players. “They were [trying to set me up against Aston Villa]. I appreciate that and I’ve just got to make the right forward runs to score and create opportunities for the team. I’m just getting used to it really and I’m just hoping for more minutes and learning every game.